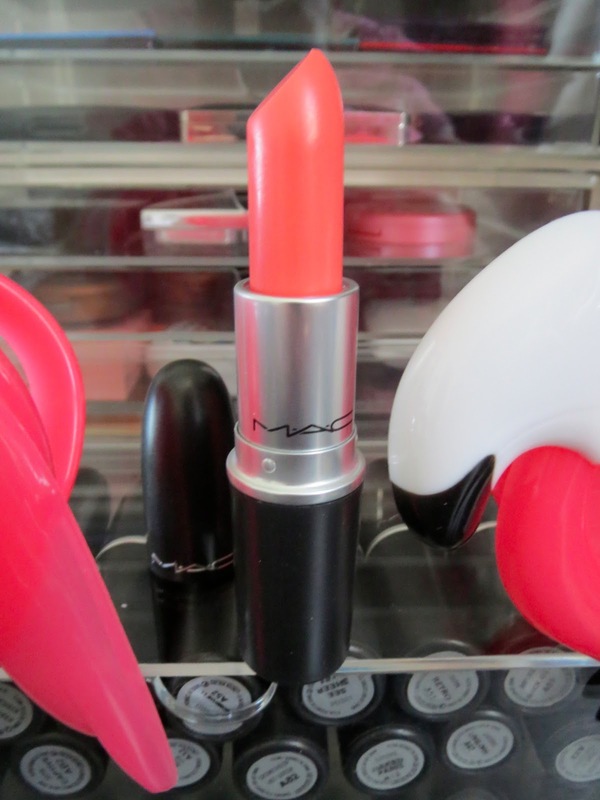 I may be a little late to the party with my review of this lipstick from Mac's All About Orange collection but it's so lovely it's worthy of a mention! Flamingo was first launched in December 2011 as a limited edition and now it's back-sadly limited edition again. I ummed and ahhed about buying any of the lipsticks and looked at online swatches several times. It was sold out on the Mac UK website but when Selfridges got the collection in I snapped up Flamingo. I'm glad I did as this is right up my street as a summer lipstick even though it's a Lustre finish which I am not that bowled over by. But the lustre finish makes it shiny and glossy and also pinker than it appears in the bullet. It's a semi opaque pink with a hint of coral. Perfect for daytime and I suspect something I will use regularly over the summer! It's much more wearable than I expected it to be. You may still be able to find it on counter and also on ebay (be careful and always go for sellers with high ratings when buying make up). It would be so much easier if Mac just launched this into its permanent collection! !